Marshal Manuel Deodoro da Fonseca (Alagoas City, August 5, 1827 - Rio de Janeiro, August 23, 1892) was the first president of the Republic of Brazil and he reached this position after a military strategy that put down the Emperor Pedro II. Son of Manuel Mendes da Fonseca (1785-1859) and Rosa Maria Paulina da Fonseca (1802-1873). His father was also a soldier and belonged to the Conservative Party. He had two sisters and seven brothers and three of them died in the Paraguay War: Afonso Aurélio da Fonseca (the youngest), ensign of the 34º Voluntários da Pátria Battalion; captain Hipólito Mendes da Fonseca, dead in the Battle of Curupaity; and major Eduardo Emiliano da Fonseca, dead in the Battle of Itororó. His elder brother, Hermes Ernesto da Fonseca, father of Hermes da Fonseca, was a marshal in the Brazilian Army, president of Mato Grosso province, governor of Bahia province and commander-in-chief in Bahia and Pará provinces. 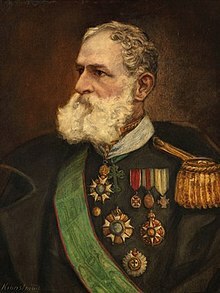 Two other brothers also had brilliant military and political careers: Severiano Martins da Fonseca, who reached the rank of field marshal, received the noble title of Barão de Alagoas (Baron of Alagoas) and was the director of the Military School of Porto Alegre; and Pedro Paulino da Fonseca, who was an honorary colonel of the Brazilian Army, head of government of Alagoas and Senator of the Republic for the same Brazilian state. In 1843, at the age of sixteen, Deodoro enrolled himself in the Rio de Janeiro Military Academy and finished the artillery course in 1847. In 1845, he was already a 1st class cadet. In 1848, he took part in his first military action, helping to repress the Praieira Revolt, an insurrection promoted by the Liberal Party of Pernambuco. He got married when he was 33 years old, on April 6, 1860, to Mariana Cecília de Sousa Meireles, who was considered by biographers a very well educated woman, religious, modest and full of domestic attributes. They did not have any children. His nephew Hermes da Fonseca, who also reached the Brazilian presidency, was treated like a son by Deodoro. This page was last changed on 3 February 2014, at 10:57.